We got her when she was just a puppy for my 13th birthday. I remember my father brought her home, holding her in just the palm of his hand behind his back. She was so little! And I was so happy. From the very beginning Missy and I we’re inseparable. I woke up extra early every morning before school to walk her. She always did this funny thing where she never wanted to wake up early so I had to literally drag her across the floor with her little harness. She was definitely NOT a morning dog (just like her mommy). We would play outside for hours. Missy was always very feisty and full of energy. Although there were many great times with Missy, she went through a lot of struggles in her life, just like my sister and I did growing up. When my parents got a divorce, my father was forced to leave and we grew up in a neglectful household. My mother and step father were both addicts and would disappear for days at a time leaving my sister and I to care for her. Sometimes there would be no food and we would have to chef something up. My step father was also abusive toward her. When he got angry, sometimes he would let it out on my poor Missy. Whenever we could, we would bring her in our room where she was safe. She would sleep under the covers by our feet. She also went from home to home at one point of her life. When my mother and stepfather refused to bring her to the vet and wanted to put her down for no apparent reason, I took it upon myself to find homes for her until I could figure something out. Missy eventually wound up at my fathers which was the best thing for her. I was so grateful he took her in even with his other two dogs and two younger children. It was a little cramped, but he made it work. My father and step mother took such amazing care of her up until her death. Although Missy wound up at my fathers home and had great care, there were still more hurdles for her along the way. She had developed many health problems. 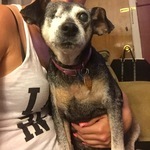 She had to remove one of her eyes because there was pressure on her retina, she had her uterus removed due to infection, she also had arthritis and skin issues. We all worked together to care for her. My Missy was a survivor like my sister and I, and fought hard to the very end. She lived a long life up until the age of 15 years old. She taught us patience and love and will forever hold a special place in our family’s hearts.